Product Description:- Renesa Cardiac kits are qualitative In-vitro Diagnostic kits for early detection of Myocardail Infarction. 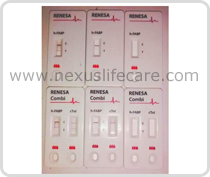 Renesa Cardiac kits has high accuracy, sensitivity and specificity as compared to Troponins. Useful as a point-of-care treatment. Renesa Cardiac kits can be detected as soon as 30 minutes after onset of symptoms. About 6 hours later h-FABP reaches its peak and returns to its normal level after about 18 to 24 hours. In contrast it takes about 4-6 hours until the classical marker for myocardial infarction Troponin can be detected by bedside tests. Troponin stays elevated for about 10 days.